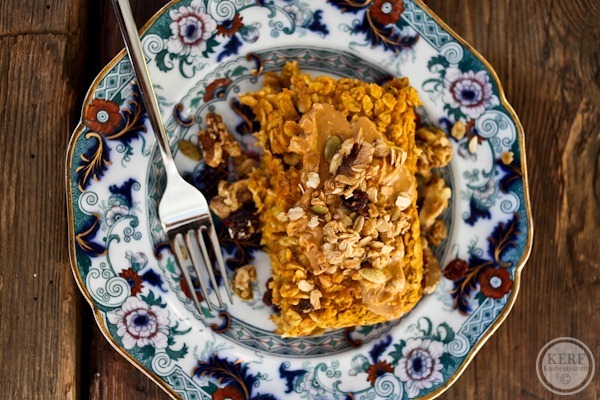 I love having baked pumpkin oatmeal for breakfast in the fall. It’s gooey on the inside, crispy on the outside, and lovely to reheat the next day for a quick and easy breakfast. I normally make it in a loaf shape and cut in in slices. Topped with almond butter and granola! I was pleased that Mazen loved it, but the loaf was kind of hard to cut for him. So I had the idea of pouring the batter into mini muffin tin to make it easier to serve. I found my first batch to be hard to remove from the pan. I think this is because I did not let them cool completely first. The second batch came out beautifully with some coconut oil rubbed well on the inside of the cups and a very patient 20 minute wait for cooling. 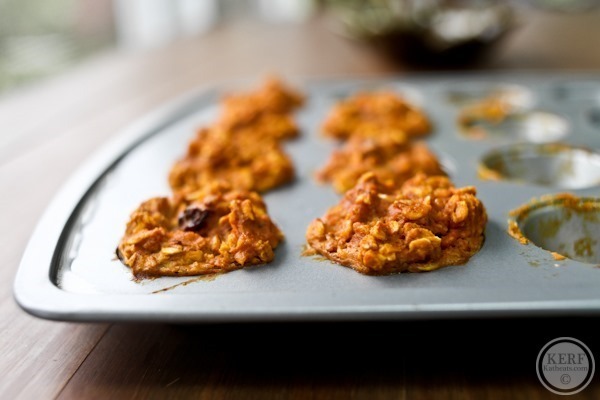 A twist on baked pumpkin oatmeal, these are perfect for little fingers! Beat eggs and add all other ingredients in a large bowl. Mix together. 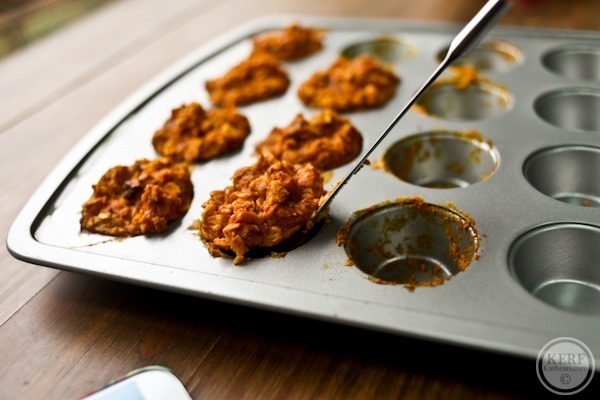 Grease a mini muffin tin well and pour batter in to the brim. Bake for about 15 minutes, or until cooked through. Allow to cool COMPLETELY before removing or your oatmeal might stick. Use a knife to cut along the edges and twist to remove. And for a crazy twist, have fun with the round shape! 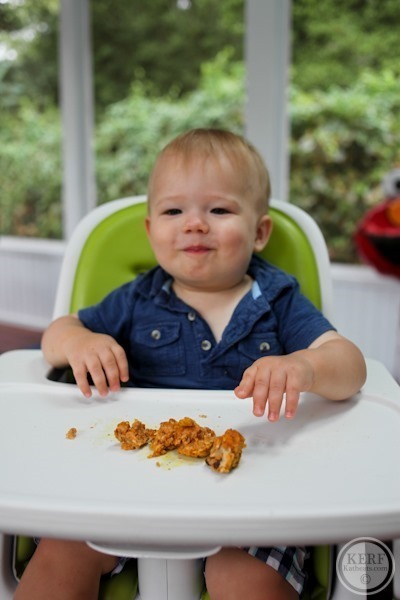 Great recipe – perfect for the little guys! 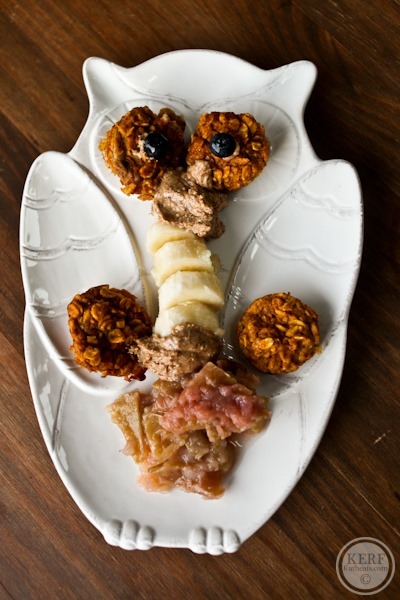 But I have to admit: that owl with the banana vertebrae and apple innards is freaking me out. Maybe save that picture for Halloween? Haha I think the “allow to cool completely” part would be my downfall! I’m so bad about trying to take things out of the pan asap and store them away (or eat them…). Yumm-o! Do you think steel-cut oats would work? Or do they take too long to cook? 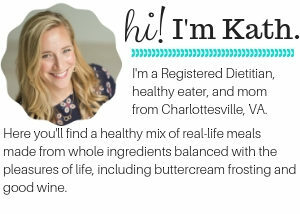 I’m new to oatmeal, and I know you’re the guru! I don’t think they would cook enough. Maybe if they were mostly cooked first? These look awesome I can’t wit to try the recipe!! yum!! pumpkin oatmeal is the bombbbbb in fall!! Yum! I have been looking for portable breakfast ideas for an upcoming road trip and I love oatmeal….these looks perfect! Plus, pumpkin=win. Always. Your original pumpkin baked oatmeal is delicious and I have made it several times. I bet I would love this mini version too – the banana sounds like a yummy addition! They look so good! Wonder if they would work with almond milk? Looks & sounds delicious. I like easy, healthy snacks to grab to take to work for breakfast, and I bet this fits the bill. Thanks for sharing! Yum. And with gluten free oats, they are gluten free – yay! Also, Mazen is adorable; he seems like such a happy boy! Yum!! As I think about making small changes to my morning schedule (for more effectiveness, etc. ), I’ve been looking for breakfast ideas that would work better than my bowl of cereal. This looks delicious – definitley worth trying! Do you know how long the shelf life is for Coconut Oil? I bought some, kept it in my pantry, and it looked like it developed mold around the lid…This was my first experience with Coconut oil so maybe I wasn’t storing it properly? 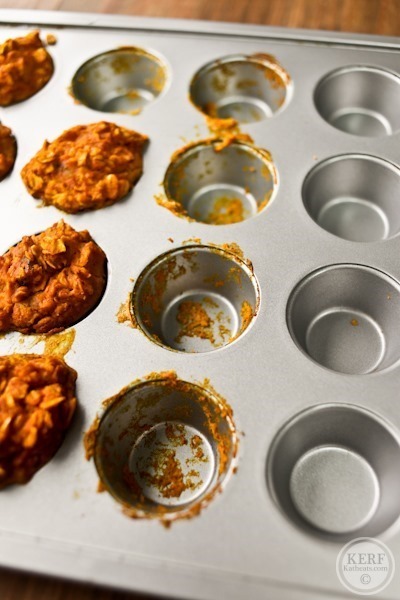 And I bet this might work in reg sized muffin tins for a larger portable breakfast (maybe a longer cooking time thought?). I’ll give it a try this weekend and report back! This looks awesome! 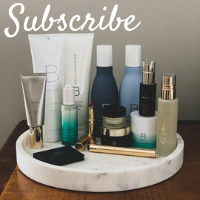 I’m definitely pinning this to make over the weekend! I made them too! I used a silicon muffin tray and they popped out once cooled! I love this recipe and I can’t wait to make it. This will make a great breakfast, and I have trader joes cookie butter that might go well on top but sometimes I like it just by itself. Quick and easy breakfast. Mazen loves them! 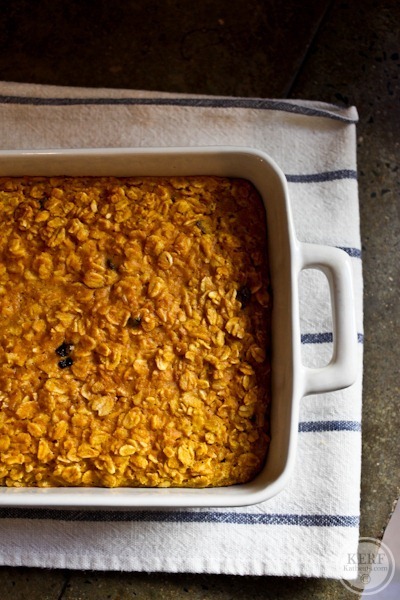 I am such a lover of baked pumpkin oatmeal. I am on the way to perfecting my recipe. 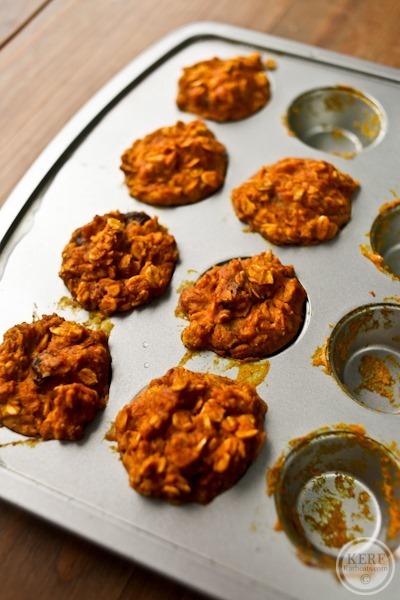 This is such a good idea to bake them in muffin tins. Cute! Looks delicious and anything Maze likes, I like! 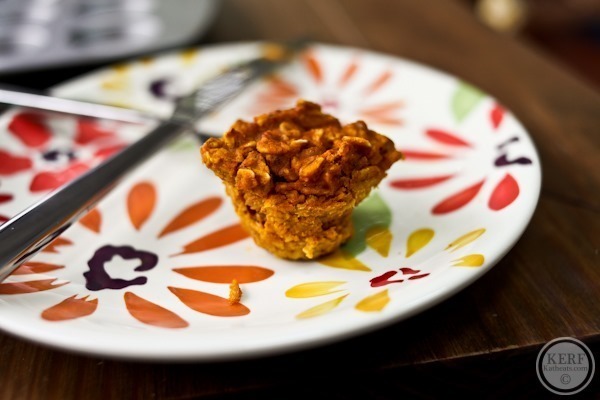 Do you know if any readers have used a flax egg successfully in place of an egg? Yum! 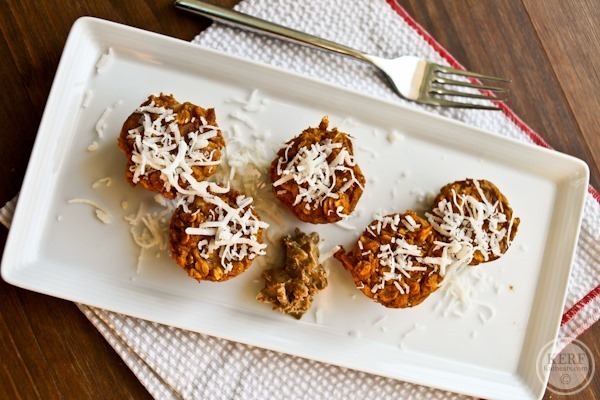 Thanks for posting, we love the baked pumpkin oatmeal and I am SO excited to try the bites! The look on Mazen’s face in the 2nd last pic really says it all! He looks like he is really enjoying it. Great idea, I am very keen to give it ago. Love these! 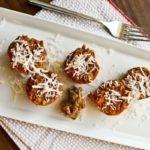 I want to try them with craisins and nuts as I bet it’d be delicious! These would be great office snacks! So did you not grease the tin at all on your first go-around? 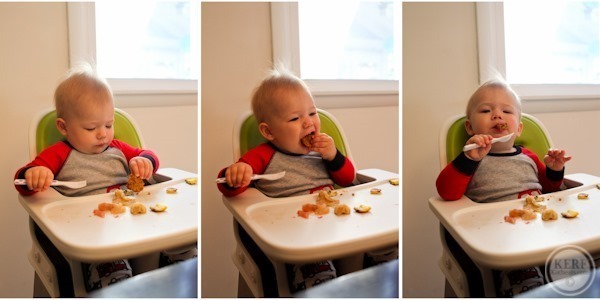 Just a word of caution, you should ask your pediatrician about the safe age to give raisins to a baby. They are a big choking hazard and usually not recommended until at least two years of age. And even then, dentists don’t love kids eating raisins, they are so easily stuck in teeth and can lead to decay. In 2010, the American Academy of Pediatrics removed raisins from their list of choking hazards because they couldn’t find any reported cases of children choking on raisins. The tooth decay thing does make sense though. Good thing we have toothbrushes! I cannot wait to make these tonight! I love ANYTHING pumpkin…:) Thanks for the recipe. Awesome recipe. So simple and looks delicious. I don’t actually have kids but I’m thinking these will be a great snack for myself! Plus it’s the perfect time of year to be using pumpking. I made these, and they’re FANTASTIC! Do you have the conversion recipe for when you bake it in a loaf pan? Size of loaf pan, length of cook time, etc. I clicked on the Baked Pumpkin Oatmeal link to try it. I have question – what size pan do you bake this in? It’s not listed. Can egg whites be substituted for the one egg ? Would you recommend freezing these? If so, how? Yes tightly wrapped in Plastic wrap and/or freezer bags or a glass container.